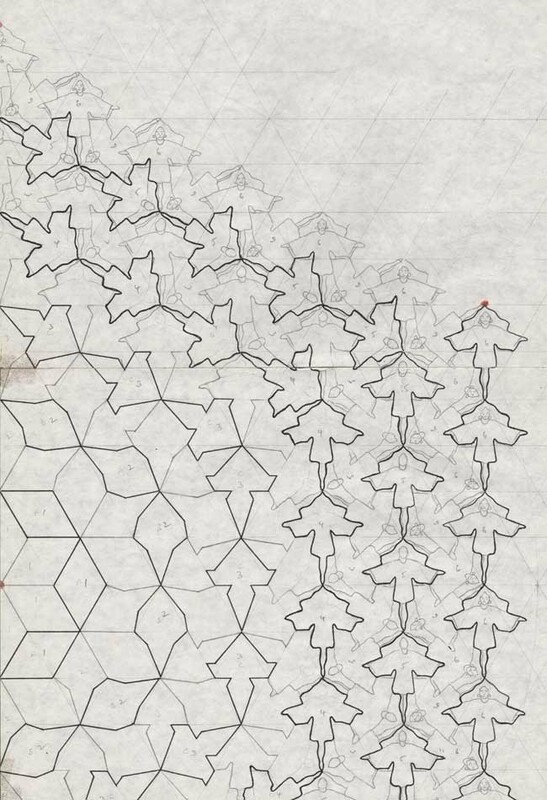 Prior to showing a definitive motif is an intermediary stage where, although the basic life-like tessellation is established, in this instance a girl motif, it might still be possible to improve upon the motif, of which this drawing shows. Here, I try our various experiments in the desire of potential improvement of the verisimilitude. As ever, when making one change, this also affects the ‘other’ side of the line. For example, by raising the hemline of the dress, this also affects the hair, changing its length (and vice versa). This, simply stated, is a typical trade-off in designing – will changing one aspect affect the other, and to what degree? For example, if one change is made that is only slightly for the better, if the other side is affected disproportionately, i.e. much worse, than overall the tessellation is made inferior than it was before, and so this would not be proceeded with. Another experiment shown is at the bottom of the dress, when rather than being of a ‘smooth line’, is instead shown pleated. On the other side of this line, it can be seen that this results in the hair being made wavy. Again, is this an improvement? Arguably, it is, on both counts. A dress can be made pleated, and hair is naturally wavy, and so both factors arguably improve on the initial, somewhat simplified outline. Although in this instance the improvement here is slight, by such small, though significant advantages, the figure is noticeably enhanced. Therefore, critical judgement comes into play as to aesthetics overall when experimenting in this way. 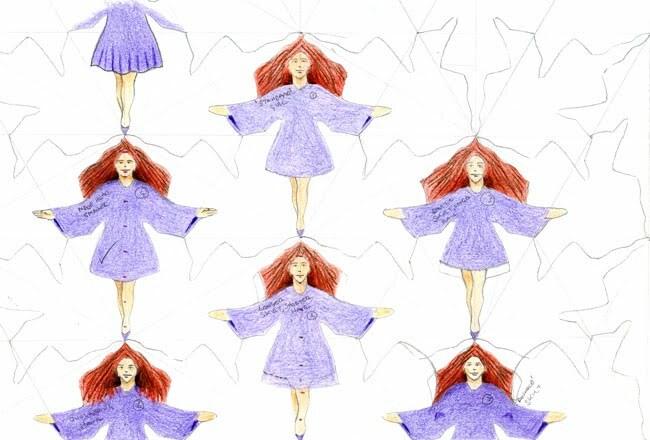 Here I show the girl motif adapted to a Kaleidocycle. This is designed for two pieces to be joined together, at the tabs. Colouring is left to the user. Upon completion of a life-like tiling, it is possible to develop this, both metaphorically and literally, with compositions based on the underlying tile. 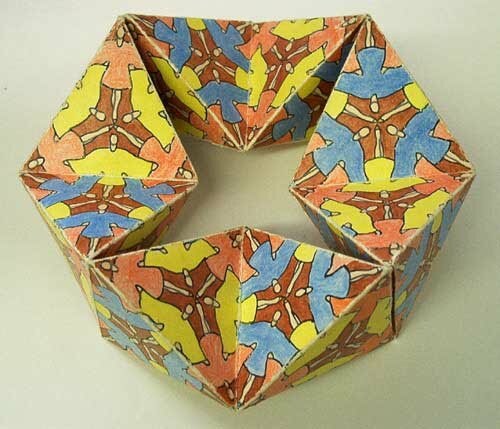 In this particular instance, with the girl motif based on a rhomb, the obvious formats are of a rhomb, and hexagons (the latter of three conjoined rhombs). Now, it will be observed that both the tile and motif is mirror symmetric along the long axis (aside from the crossing of the legs, for reasons of aesthetics, which I consider a pedant quibble as regards symmetry). Now, an obvious thought is that it as this is so, when undertaking a development it would be very pleasing to retain this feature. That is, a development from a rhomb to the girl motif, all the while preserving the mirror symmetry of the rhombs. Can this be done? Yes. So, on the premise that a symmetric development is superior, I here show some compositions based on this type. The examples below show two different compositional forms, a ‘linear’, and ‘hexagonal star burst’. The premise of this is of a linear development from rhombs to a girl motif, all with the interpretation of (symmetrical) development. This example more clearly follows Escher’s example, namely Metamorphosis I, albeit with subtle differences, concerning the shading, rather than that of the more important development process. As can be seen, in my version, the development at all stages is mirror symmetrical, and so aesthetically is most gratifying indeed, for obvious reasons. Naturally, an asymmetric development would be less pleasing on the eye. 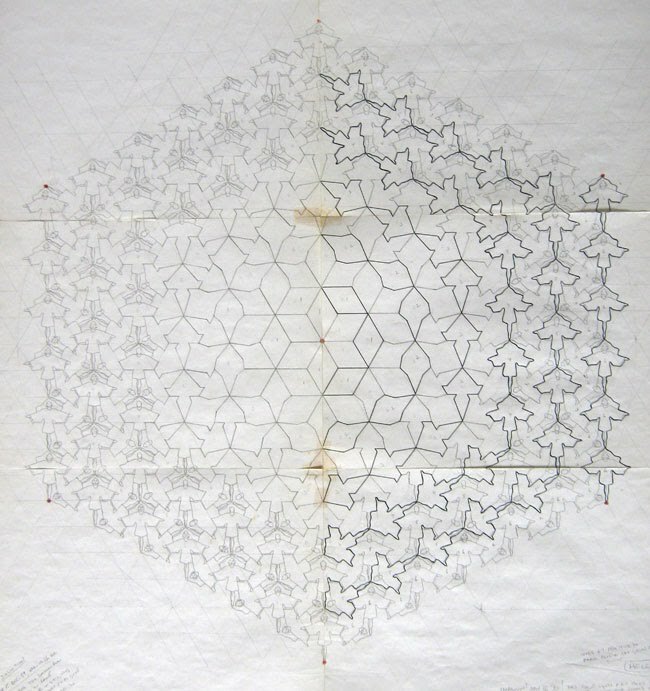 The premise of this development is of a ‘starburst’, within an overall hexagonal format, this being derived from the unification of three rhombs, of which the connection is obvious. The premise is of a (symmetrical) radial development from a centre point (a ‘Big Bang’, if you like) with the development proceeding from the centre outwards, with rhombs per se; to eventually the outer rim, with fully-formed (symmetrical) girl motifs, all the while retaining the symmetry in the interim. 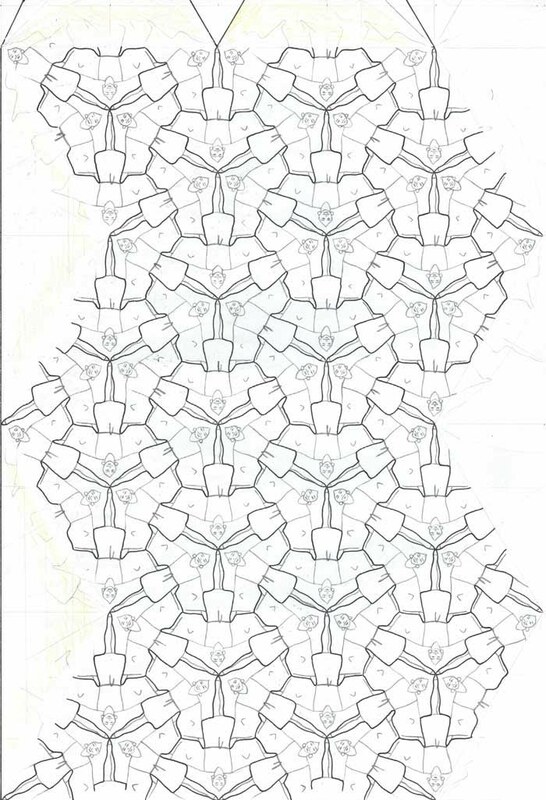 Note that it is possible to reverse the process if one would so wish, with the rhombs on the outer, with girls at the centre. However, I consider this to be the ‘weaker’ of the two options, if these are compared directly. The reason for this is that from the human perspective, the more ‘interesting’ (and numerous) life-like motifs (girls) are shown, rather than ‘less interesting’ rhombs.